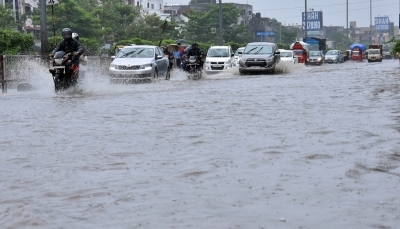 Gandhinagar July 14 (IANS) Friday the 13th turned out to be a nightmare for the usually dry Saurashtra region of Gujarat as the rain gods lashed it with torrential downpours that claimed three lives. During the last 10 hours the region has received from 60 mm to more than 180 mm rainfall particularly in the Junagadh district the state emergency response centre said. For the past 10 hours heavy rains hit Kodinar taluka (tehsil/block) of Junagadh district with 180 mm downpour. Heavy downpour also took place in Maliya and Sutrapada talukas of Gir-Somnath district with 175 mm and 166 mm of rains respectively. Visavadar in Gir-Somnath received 96 mm of rains on Friday. Other talukas like Bhesan and Mendarda of Junagadh district and Talala of Gir-Somnath district registered 85 105 and 85 mm rainfall over the past 10 hours. Veraval in Gir-Somnath received 75 mm and Jamkandorna taluka in Rajkot district received 98 mm rains. According to the Paschim Gujarat Vij Company Limited (PGVCL) power supply has been affected in 24 villages of these districts besides Amreli where supply has been cut off in five villages. Shetrunji Dam in Saurashtra is overflowing with flood waters. The authorities have shut 154 roads of the state including one national highway and four state highways. Meanwhile incessant rains continued in south Gujarat with Waghai in Dang district receiving 60 mm Mangrol in Surat 55 mm and Meghraj in Aravalli 52 mm rainfall. The Met Department has predicted that torrential downpour will continue in Gujarat over the next two days with heavy to very heavy rains in some regions.